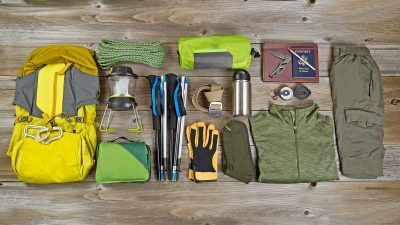 How to keep your gear tidy and organised. 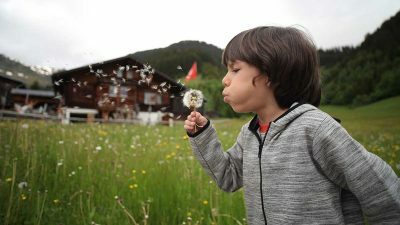 This article originally appeared on Fix.com and has been republished with permission. Words by Lee Wallender. Is your garage a safe, dry home for your vehicles and gear? Or is it a cluttered, frustrating junk catch-all that makes your blood boil whenever you open the garage door? Since it’s estimated that only one-third of the people who have garages actually use them to store vehicles, obviously you are not alone. But you can organise your garage and reclaim territory for your vehicles with a simple organising method that you can spread out over three relatively easy weekends. Take heart: garages were never meant to be spotless palaces with floors clean enough to eat off of. Garages have two functions. First and foremost, they store your vehicles. Second, they store possessions that are either too large or too dirty to go in the house. And often they store possessions that are used so rarely that it’s not necessary to have easy access to them in the home. Besides relying on your emotional response to the cluttered garage, what are some objective yardsticks that tell you when things should go? Vehicles are parked in the driveway or street because they won’t fit in the garage. You find it difficult to access key areas such as the water heater, washer and dryer, main water shut-off, electric service panel, light switches, outlets, and doors. You have boxes that have not been opened for more than one year. 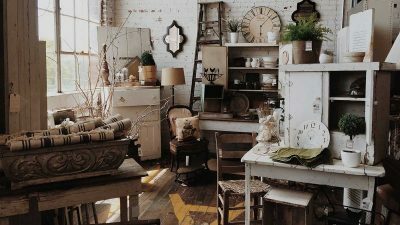 The reason for this “one-year rule” is that the garage is a valid storage area for seasonal items like Christmas decorations. Your primary objective with unwanted items should be to sell them. 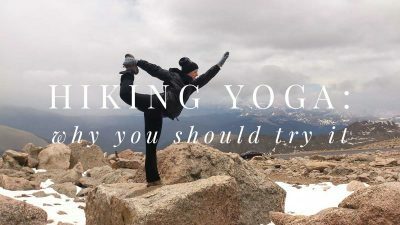 By doing so, you keep things out of landfills, earn a little cash, and help out someone who needs an iron, surfboard, or desk lamp but cannot afford to pay full price for a new one. Items listed on Craigslist tend to command higher prices than those offered at garage sales. Help people in need by donating unused but desirable items to your local thrift store or Habitat for Humanity ReStore. To avoid dumping your unwanted junk on volunteer or low-paid staff, phone in advance to see if the items will be accepted. Craigslist’s Free section is a sure-fire way to get rid of unwanted possessions quickly. 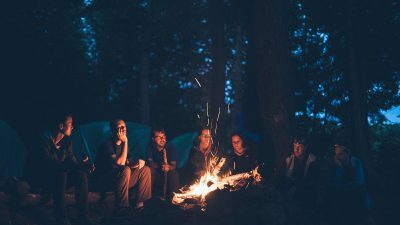 As long as the item is not a complete dud – dirt, rocks, old beds, and used tires languish in this free section – you can expect to have an eager taker show up at your door within a day or two. Possessions that cannot be sold, donated, or given away belong in the trash. Strip off as many recyclable parts as possible (e.g., plastic, glass, paper). Discard the items in your regular trash or, if they’re too numerous, call a hauling company or rent a roll-off dumpster. Gasoline, paint, and other volatile liquids. Even quick-starting charcoal briquettes are considered volatile. Put these items in a garden shed well away from the house. Old magnetic recordings (tape, videotapes, etc.). Temperature spikes experienced by garages can deteriorate these media. Keep these in a cool, dry place inside the house. Excess food items. If you have no room in the kitchen or pantry, store food in a bedroom closet. Clothing, particularly vintage items, will develop mould and mildew when stored in your garage. Return clothing to the house. After you’ve taken care of the other five categories, you should have sufficiently thinned out the category of items that go back in the garage. Items that do belong in the garage include bicycles, tools, seasonal decorations, and of course anything automotive-related that does not contain volatile liquids. Organising your garage all at once is a mammoth, soul-crushing project. However, as with any other large project, the key is to break it into manageable sub-projects spread out over time. Choose a weekend when the weather is forecast to be dry and warm. Begin early in the day. Remove vehicles from the garage and park them on the street or at the very end of the driveway. 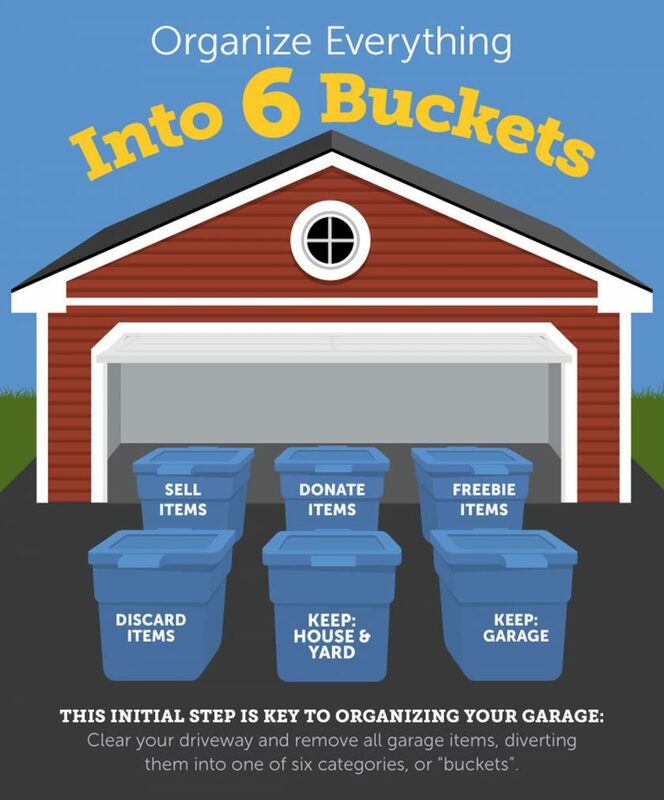 Open the garage door and remove all items from the garage one by one, placing them in six separate areas or “buckets,” as outlined in the previous section. Take care of Donations, Discards, Freebies, and Retain but Remove items. Put the remaining items back in the garage. Devote this weekend to building the wall hanging, ceiling hanging, or shelving units detailed in the next section. At the same time, sell the desirable items. This weekend, the climax of your organising efforts, is when you reap your rewards. All of your remaining possessions get boxed up in plastic bins and stored on shelving units, hung from wall systems, or elevated above the garage floor on ceiling racks. Before putting an item in a box, take this opportunity to dust it off, assess it for damage, and ask yourself one last time if it really belongs in the garage. If you didn’t already know it, configuring dimensions for garage storage is tough. The culprit: garage sizes imposed by architects and builders. A two-car garage can be as diminutive as 20 feet long and 20 feet wide. This allows for only a door-scraping 36 inches between cars, leaving two narrow strips of storage real estate on either side of the cars. This calls for a double-pronged attack: hang items from walls and the ceiling, and create shelving systems to hold boxes and other large items. The days of hanging tools on nails are long past. Even that old-school storage mainstay of the garage, a pegboard and hooks, has been eclipsed by smarter, sturdier hanging systems. 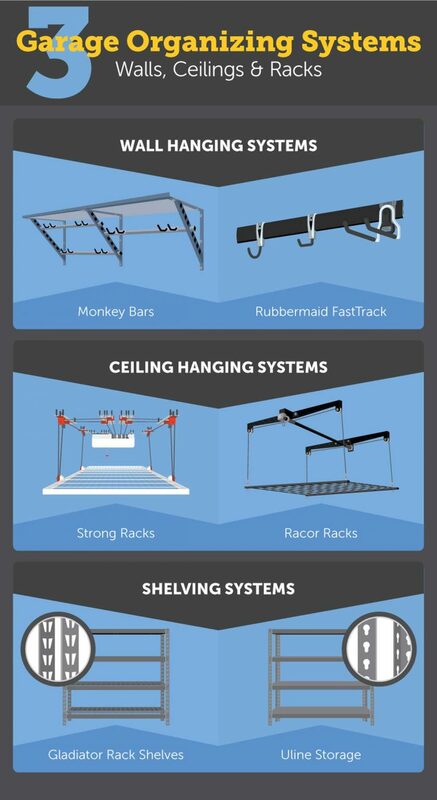 Monkey Bars: This system is dedicated to the lofty mission of getting every possible item off of your garage floor. The Monkey Bars tempered steel bar and hook system is completely adaptable as your needs change. Rubbermaid FastTrack: If you’re not ready to invest in an expensive hanging system, FastTrack is a simple method that involves short steel rails that accept metal hooks strong enough to hold extension cords, shovels, rakes, and even weed string cutters. They’re available in five-, six-, and eight-piece packages with rails sized to attach to your garage’s wood studs for stability. Strong Racks: Because it’s dangerous to carry heavy boxes up a ladder to ceiling racks, Strong Racks has a better idea: bring the racks down to the user. Power RAX 4’ x 4’ steel wire platforms ascend and descend from the ceiling at the push of a button and are strong enough to hold heavy loads such as spare tires, surfboards, or bikes. Racor Racks: Would you manually lower your ceiling racks to save a few hundred dollars? For about half the price of Power RAX, Racor Ceiling Storage Lifts hold up to 250 pounds, lifting and lowering by means of a hand crank. To save your arm, you can even attach the hand crank to a power drill. Gladiator Rack Shelves: A Whirlpool Corporation subsidiary, Gladiator makes steel rack shelves that live up to the company name. Capable of holding up to 2,000 pounds – yes, that’s one tonne! – Gladiator’s 60”- and 77”-wide welded steel shelves can hold the heaviest of your boxes. Uline Storage: Uline’s 72” warehouse storage racks have a weight capacity of about half of the Gladiator shelves (1,200 pounds). But there’s one important difference. The Uline racks come with three particle board inserts, 5/8” thick each, that accommodate smaller items that might fall through steel wire rack shelves. Liberate your vehicles from the driveway or curbside, and give them the home they deserve: a nice, dry garage. Smartly organising your garage helps you feel better about where you live, de-stresses your daily life, and frees you to concentrate on more important things. Posted in: Lifestyle Tagged: How to? 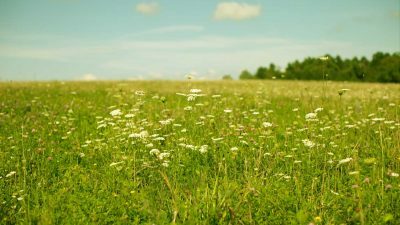 Here are a number of tried and tested techniques to reduce stress levels naturally. 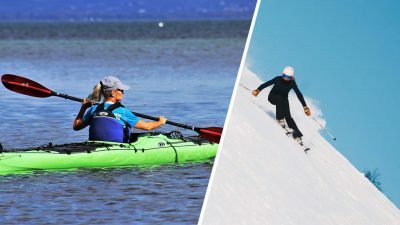 The ‘Women in Adventure Mental Wellbeing Survey’ looks at the effect of outdoor sports on the mental wellbeing of women and has thrown up some intriguing results. Whether you're looking to downsize or go travelling for a year, it's likely that you'll need some form of long-term furniture storage. A bad night's sleep can dampen the spirit of any adventure trip. Add this gear to your kit and you'll be sound asleep in no time. 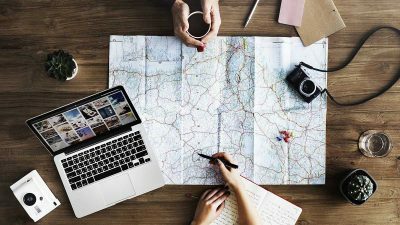 Website design is a great option for those seeking a digital nomad lifestyle; all you need is a laptop and an internet connection. 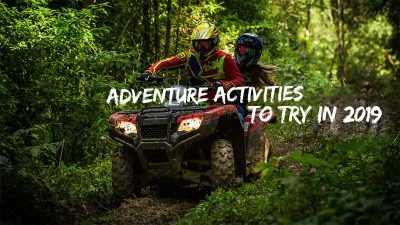 Get your whole family hooked on the active life instead of Fortnite. 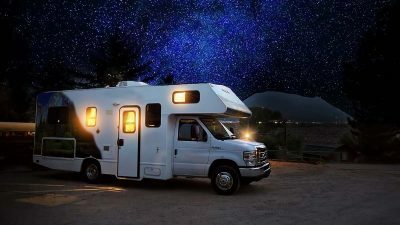 Adding a few personal touches can make all the difference to transforming your RV into a home away from home. 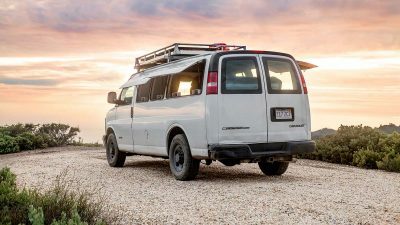 From start to finish, this guide will walk you through every step of building a cosy converted campervan. 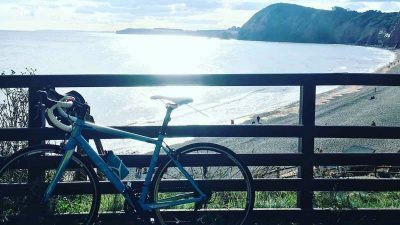 Jenni Morton-Humphreys posed as an interested buyer to reclaim her treasured Cube road bike.